Homemade body scrubs are easy to make. When you make your own body scrubs you will be sure of the quality of ingredients that you are putting on your skin. As your skin is your body's biggest organ with so many essential functions, natural organic skin care is very important. These body scrubs are great for both men and women. A body scrub will exfoliate your skin, removing old dead cells and therefore making new skin cells glow radiantly at the surface. Using a body scrub will help to keep the skin healthy and better able to carry out its functions of absorption and excretion. Body scrubs will moisturize your skin and will feed your skin when nourishing herbs and oils are added. On this page I will show you how to make body scrubs by sharing the simple body scrub recipes that I have made and that we use in our home. Scroll to the bottom of this page to see more information about the ingredients used and where you can get these ingredients. For best results always use organic ingredients and make your homemade body scrub recipes with LOVE - this is the secret ingredient that makes all recipes shine. Combine weekly body scrubs with daily dry skin brushing for even better effects. Also check out our page on natural sea sand scrubs. This homemade body scrub recipe is so simple and almost everyone will have these ingredients in their cupboard. This is the basic recipe that you can build on as I will show you in the below recipe for the Herbal Body Scrub. I usually use fine sea salt for this scrub but sugar also works nicely as an exfoliant. This is really the only time you will ever hear me recommending the use of white sugar. Other than for this homemade body scrub recipe there isn't really a place for white sugar in a healthy life. Mix ingredients and store in a jar. In the shower, use this scrub all over your body and then rinse off. Your skin will be left soft, smooth, shining and moisturized. This recipe builds upon the above Basic Body Scrub Recipe. By adding dried herbs and essential oils you boost the effectiveness and nutritive value of your homemade body scrub. 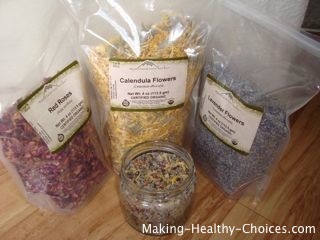 The herbs mentioned here are very nourishing for our skin as are the essential oils. See below for more details. The aromas from the herbs and essential oils will also have healing and uplifting effects on your system. Aromatherapy body scrubs like these can be very costly to buy, now you can make our own body scrubs and enjoy them at home or give them as gifts. Mix all ingredients in a jar, I usually use a wooden chopstick to stir everything together. Let your senses be your guide and adjust the ingredients to make a scrub that smells and feels right for you. Experiment with different herbs and different oils to come up with your own unique recipe. Olive Oil is a wonderful skin moisturizer that is rich in vitamins, minerals and antioxidants. Be sure to use extra-virgin olive oil which is from the first pressing of the olives and therefore the most nutritious. Olive oil tends to have a warming effect which makes it excellent on those cooler days. Extra virgin olive oil is readily available in most grocery stores. Almond Oil is a lighter oil that is well absorbed and will improve the penetration of essential oils. To learn more and/or to purchase almond oil, click here. Lavender has a beautifully uplifting fragrance and has a long history as a cleansing herb. It is also known to stimulate hair growth. For more information and/or to purchase lavender, click here. Rose, with its beautiful aroma, is considered to be a cell rejuvenator as it helps to smooth and soften dry, wrinkled skin. Rose is known for its antiseptic, aromatic, astringent, hydrating, rejuvenative and soothing properties. To learn more and/or to purchase rose petals, click here. Calendula is a wonderfully healing flower that belongs to the daisy family. It improves circulation and helps to improve skin conditions such as acne, eczema or psoriasis. Calendula is known for its antifungal, anti-inflammatory, antiseptic, astringent, demulcant, and vulnerary properties. To learn more and/or to purchase calendula, click here. Essential Oils are amazing to have on hand. They have a variety of uses including being added to many of your homemade products. Essential oils are the oils extracted from a plant by steam distillation. They are pure and highly concentrated and, so, a very little goes a long way. With essential oils always be sure to purchase from a trusted source and get oils that are therapeutic grade. To buy, online, from a source that I trust for essential oils, click here, I am always impressed with their high quality. Essential oils are anti-microbial, anti-fungal, anti-viral and antibiotic which make them ideal for many applications from cosmetics to medicines to cleaning products. Adding them to your products will also help to preserve and extend the life of your homemade creations.